In researching Polish ancestors it is important to understand what the boundaries of Poland were at a given period in time. Poland's geography has been redefined many times. Unless you understand these basic changes, it can be confusing to understand why your why your Polish ancestors who immigrated to another country would declare their country as; Germany, Prussia, East Prussia, Russia, Austria or Hungary. Your ancestors answer were politically correct, but it did not necessarily reveal their ethnic origin. They were of Polish descent, but they were caught up in the boundary changes associated with Poland's political history. They lived in an area that was not longer under Poland's control. In certain periods of history, Poland didn't even exist as a country. You may be familiar with the current map of Poland (above). It is useful reference if you are trying to determine an area were someone is living in Poland today. However, it may not be a good reference for locating where your ancestors may have come from in Poland. This section will help to understand why. In 1660, Poland's territory was quite extensive, stretching far beyond the area of today's Poland. Note the difference is mainly in the eastern and southeastern regions. Poland controlled major portions of Russia and Hungary that included Galicia. In 1864, Poland was non-existent as a country. The territory that was once known as Poland was controlled by Prussia, East Prussia, Russia and Hungary. This is commonly referred to as the Partitions of Poland (explain below). As a quick understanding of how much Poland has changed compared to today's map, take a look at Table 1 which has an white outline of the current map overlay on that specific period. In 1660, Poland's territory was significantly larger than it is today. Viewing Origins and Chronology of Events of Poland may be help prior to reading this section. Historians believe that the area comprising Poland today, was settled by the Slavic tribes as far back as 2,000 B.C.. In the 800's, several of these Slavic groups banded together which was then Polane. It was one of the largest of the groups in the area at that time. In the middle 900's, Prince Mieszko I ruled over most of the land along the Oder and Vistula rivers. His son, Boleslaw I would become the first King of Poland in 1025 [View: 1025 Map]. Earlier, he had conquered the land areas of what is today; Poland, Czechoslovakia, Eastern Germany, and Russia. His reign as King was short, he died that same year. Several periods of turmoil took place over the next hundred plus years. It wasn't until the middle 1100's before control was established again in the territory. The area was divided into different sections with each having it's own noble leader. In the century that followed, the area was subjected to more turmoil. Poland was invades by different peoples that took control the land. Poland would not be unified again until Casimer the Great, the last of the Piast monarchs, came on the scene. He reigned from 1333 to 1370 and during this period established a strong central government. Casimer would also stress cultural development of the Poles during this period. In 1386, Queen Jadwiga of Poland married Wladyslaw Jagiello, the Grand Duke of Lithuania. This would establish Jagiello as the reigning King of both Poland and Lithuania. Poland still remained largely a self-governing entity during his reign. Jagiellonian Kings would continue to rule Poland for nearly 200 more years. [View: 1402 Map] During the time of these monarchs, Poland was able to expanded it's territory, economy, culture and political development. It was during this period that the first national parliament of Poland was establish in 1493. The Polish empire would reach it's peak in the 1500's controlling a large portion of central Europe, including the Ukraine and other Russian lands. 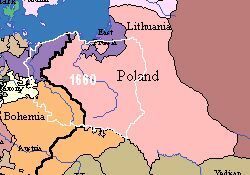 In 1569, Poland and Lithuania was brought under one parliament. In the middle 1500's, the Jigiellonian monarchy would end up relinquishing power to the nobles that dominated the parliament. With the death of the last Jagiellonian monarch in 1572, new kings were elected by these nobles of the parliament and a period of Poland's decay would begin. Several foreign Kings were elected and this leadership was ineffective. Rivalries set in among the nobles and wars took their toll on the economy. In 1548, a Ukrainian rebellion resulted is the lost of this territory. In 1655, Sweden gained control Poland's Baltic region. Several wars with Turkey ensued. All contributing to the decline of Poland's significant empire. The is a significant period for many doing genealogy of Polish ancestors. Beginning in 1772, then in 1793, and again in 1795, the territory of Poland was parceled out to the primary powers bordering it's territory, namely, Prussia (Germany), Austria, and Russia. Between 1795 and 1918, Poland would no longer exist as a country. After this partition, Poland took steps to try and stop it's erosion as a country. The constitution was changed, returning Poland to a monarchy. However, this was too little, too late. Partition II - In 1793, Prussia and Russia took control of additional land from Poland. [View 1793 Map] In 1794, an uprising led to Thaddeous Koscieusko [View Bio] leading Polish sources in battle against Russia and Prussia in an attempt to regain their lost land. They were defeated. Partition III - In 1795, Prussia, Russia and Austria divided the balance of what was left of Poland among themselves. [View 1795 Map] Poland no longer existed as an independent country. Many of Poles would joined the forces of Napoleon I who was in battle with Austria and Prussia. It wasn't until 1807 that Napoleon was able to win control of Prussian Poland. He established the state of the Grand Duchy of Warsaw. [View Source] Unfortunately, Napoleon was defeated in 1815, and once again Poland would become stateless as Austria, Prussia and Russia regained the territories they had lost earlier. Poland would be allowed by the Russians to maintain a small self-governing Kingdom of Poland under their control. Poles would continued to fight for independence resisting control. Several rebellions for independence were launched against Russia, Prussia and Austria. None were successful. In 1863, Russia's solution to this persistent problem was to try and destroy the Polish culture by declaring Russian the official language. Prussia would do the same in 1872, forcing Poles in the Prussian territory to use German as the basic language. The Poles struggle persisted and near the end of the century, they had successfully establish political parties in all three regions. End of Partitions - After World War I, the partitions ended when in 1918 Poland gained status once again as an state. [View 1918 Map]. World War I provided Poles with a significant opportunity to win back their independence. Political leaders, Jozef Pilsudski [View Bio] and Roman Dmowski were activist in gaining Poland's independence. At the end of WWI, Pilsudski led Polish forces joined Austria against Russia driving them out of Poland/Russia territory by 1915. In 1916, Austria and Germany provided a small Polish kingdom under their protection. In 1917, the Polish National Committee was formed in Parish under Dmowski. This committee lobbied the allies for an independent Poland that led to Poland winning her independence and with Pilsudski become the first chief of state. In 1919, the treaty stripped Germany of a large portion it's eastern section and returned it to Poland. The port city of Gdansk was placed under the supervision of the League of Nations and became the free city of Danzig. The area included the land of Pomerania that runs along the shores of the Baltic Sea. Poland was unsuccessful in reclaiming the land taken by Russia. In 1920, Poland and Russia would come to battle over the territory. A year later, in 1921, the Treaty of Riga came up with a compromise establishing a border that gave Poland a portion of this partition area in Russian control. (It should be noted in doing your genealogy that some towns had their name changed depending on the ruling country they were in and for what length of time.). At the end of the war, in 1945, Poland once again takes control of her country but under the dominance of the U.S.S.R. Poland wouldn't be truly free until the fall of the U.S.S.R. The following are the four primary regions that many Polish ancestors may have migrated from during the 1800s. 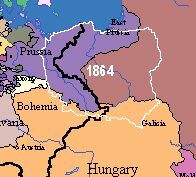 The "Rough Location" is meant in relationship to the 1864 map shown which references the regions of Prussia, East Prussia, Silesia and Galicia. North area along the Baltic Sea including northwest portion of Germany. Gdansk (Danzig - German) with a port on the Baltic Sea is the major city . Rough location to Poland today: Southeast Poland and West Ukraine area. Rzeszow and the major portion of Krakow were a part of Galicia. Rough location to Poland today: Area bordering Czech Republic and Slovakia extending along the banks of the Oder River with southern edge south of the Sudetes mountains. Wroclaw is the largest city in this region. Rough location to Poland today: Area south of the Baltic Sea, west and southwest of today's Poland. Additional map references are available in the Research/Maps Library.